View WebSphere Deployer on the plugin site for more information. This is a collection of two separate plugins that provide deployment functionality to most versions of IBM WebSphere Application Server, IBM WebSphere Portal and IBM WebSphere Liberty Profile. NOTE: ONLY PAID SUPPORT IS PROVIDED. CONTACT ME DIRECTLY VIA THE EMAIL ABOVE FOR MORE INFORMATION. Please add comments if your issues are addressed on your version of WebSphere, note the fixes proposed in the Change Log below. Disabled host verification for complex deployment environments. Provided option for verbose logging. Fixed SSL caching so multiple deployments to different servers should work. Added support for updating applications instead of complete reinstallation of artifacts. Hi, I have an issue with the step "Required Libraries For Deployments To IBM WebSphere Application Server"
I am looking in $WAS_INSTALL_ROOT/runtimes, namely "/opt/WebSphere8.5/AppServer/runtimes"
and there is only one jar present, it is ejb3exceptions.jar. Is there somewhere else I can get the required jars? Hello, I have a question. Is it possible to deploy same application on more than one server on the same node? I.e. can I list more than one server in 'Target Server' edit box - 'MyAppServer01' and 'MyWebServer01'? This is not supported at this time. I am able to do remote deployment using this Websphere Deployer Plugin in WAS 8.5.
a) Stops the existing application, b) Uninstall the existing ear, c) Installs the new ear and d) starts the application if the Start Application check box was checked in the jenkins job configuration. While it uninstalls the existing ear it deletes the Virtual Host and Shared Library entries in the existing application. It would be helpful if we get the answers for the below questions. a) Can we able to only update the ear without uninstalling the existing ear? b) Can we able to pass/configure the Virtual Host and Shared Library Path entries from jenkins. Add this as a feature request so it can be put in the pipeline. Implemented in v1.3.3 (beta). Please test and validate. We imported server certificate in cacerts in JRE that Jenkins is running against. How to import trust file in ../jre/lib/security/cacerts? We got error "java.lang.Exception: Input not an X.509 certificate" when we try to import it. Then you should be able to import your cert into cacerts. the jenkins is based on sun_jdk1.8.0_45 and the WebSphere is running with J2RE 1.5.0 IBM. WebSphere v6.1 is no longer supported by IBM. It was End of Life on September 30th, 2013. Can you possibly upgrade to a newer version of WebSphere? The project I'm working on is basically Unstable all the time (don't ask, I'm as horrified as you are). At first, I didn't know that the plugin would only run on Successful builds (documentation improvement opportunity? ), but while browsing the recent Github commits, I saw that a feature has been added to optionally run after Unstable builds. Unfortunately, your 1.4.0 beta .hpi doesn't include this change. Could you publish a new beta artifact that includes this feature? I am using WebSphere Deployer plugin to deploy to remote WebSphere instance which is federated into a deployment manager. I have added the wsadmin jars. I have also imported the DMGR admin console certificate into Jenkins JRE cacerts. and also imported WebSphere DMGR certificate into the cell trust store as recommended by another blog. Still I am getting below error. Server is up and running. I am able to manually deploy the application. Also I am able to ping from Jenkins server to the WAS server. Any help is appreciated. Connection failed: com.ibm.websphere.management.exception.ConnectorException: ADMC0016E: The system cannot create a SOAP connector to connect to host xxxxx at port xxxx. It's working now. I was using server 1 SOAP port instead of DMGR port. 1) If I create a trust keystore, and import the remote WAS self signed certificate into it, and set the "Client Truststore File Path" and "Client Truststore Password" to this keystore, do I still need to import the cert into the JRE cacerts? 2) I have imported the remote WAS self signed cert into the JRE caerts store, I was able to test connection, but I got the following "the trustAnchors parameter must be non-empty" error when I tried to install an EAR, any idea? I copied over the dummy keystore and truststore from the remote server again, no need to import the self signed cert into the JRE cacerts keystore. It's working fine now. 1.4 beta says "Added support for multiple target deployments (cluster or multiple nodes)". Can anyone help me how to put the entry for cluster/multiple nodes/target. i found the bollow problem about version 1.4 beta. 1)i choose operations is "install/update Application(s)" to deploy ear, but ear cookies setting is recover after deploy, could not keep on session id when update ear. so, i would like this update operation is "Replace the entire application" or "Replace,add,or delete multiple files" to update ear? 2)there is a exception when start application on SystemOut.log, how to resolve it.please refter to as bellow. I am a new user to Jenkins. I am trying to configure continuous portlet deployment in WebSphere Portal Server 8.0.0.1. I have downloaded the plugin websphere-deployer-v1.4.0.hpi (beta) from this website and installed it in my Jenkins. Now I am trying configure post build action to deploy the portlet's in WebSphere Portal Server 8.0.0.1, I can see only two option there, one is Deploy to WebSphere Application Server and second is Deploy to WebSphere Liberty Profile. Can you please guide me with the recipe to deploy in WebSphere Portal Server 8.0.0.1. Currently you must use the lastest Beta version to deploy to portal. This will allow you to update existing (deployed) portlets in a cluster or non-cluster environment. 1) Select, "Deploy to WebSphere Application Server"
Can I change WAS admin console port from 9043 to others? In job configuration pages I found textfield for SOAP port only. I have copied the DummyClient keystore file to Jenkins JRE path, and i imported the certificate to <JRE_Path>. When i am trying to deploy, jenkins goes into loop and display message "Deploying 'HUB' to IBM WebSphere Application Server"; after that nothing happens. I don't know what is client keystore and trust store password is, as it was third person who installed webspherer. Some body please guide me where i am doing wrong or missing some steps, also which port number should i use to deploy. I am using jenkins 2.70 and WDP 1.3.4 to deploy an EAR file into WAS 8.5.5.0. When I set the Application class loader policy to "PARENT_LAST " in Jenkins WDP 1.3.4, it was not set properly in my Webshphere application server 8.5.5.0,it was set to Default class loader policy and also "Override class reloading settings for Web and EJB modules " checkbox was selected. We are using Jenkins 2.60.1, Websphere Deployer Plugin 1.3.4 with WAS7 and deployment is failing. We are able to connect with Test connection with the dmgr using the SOAP. We have a cluster of 2 nodes. Target Cluster - given the cluster name which has 2 nodes. the deployment is failing , any help is appreciated. Error deploying to IBM WebSphere Application Server: org.jenkinsci.plugins.websphere.services.deployment.DeploymentServiceException: Could not determine if artifact 'XXXXXXX' is installed: AdminException: ADMA0089E: The AppManagement MBean is not found. i have added latest IBM V8 jars and added trusted certificate in cacerts, still getting issue. can you please hep me on why i am getting this issue and how can i fix. I m also facing the same issue did you find any fix for this. If we use 1.3.5 version plugin, we don't have option to give the name of application and virtual host. So I am using this version of plugin. It is able to stop the running application but unable to uninstall and update new version of application. Getting the following error. Can you help me in fixing this issue. ADMA5104I: The server index entry for WebSphere:cell=ws-cell,node=xxxxx1+WebSphere:cell=ws-cell,node=xxxxx2 is updated successfully. ADMA5102I: The configuration data for app-service from the configuration repository is deleted successfully. ADMA5011I: The cleanup of the temp directory for application app-service is complete. ADMA5106I: Application app-service uninstalled successfully. ADMA5069E: The installation of application app-service failed. This application was in the middle of a full update and therefore is uninstalled from the configuration session. Discard your current configuration session immediately to recover the application. Do not save changes to the WebSphere Application Server configuration repository. The application is not uninstalled from this repository. Until the current configuration session is discarded you do not see this application in the current session. Thanks for the immediate reply. I am able to deploy and start the application using 1.3.4 plugin. But it is creating the new application with the name specified in POM.xml and with default_host, instead of updating the existing application. The name of application in POM.xml and in WebSphere are different. Can you please suggest me a way to pass the Name of the application and Virtual Host from Jenkins to update the existing application in WebSphere. You can't at this point. Can you please suggest me any other way to update the existing application in WebSphere from Jenkins. In version 1.6.0 you can now specify virtual_host. This should address your virtual host issue. When I build my job, I always get below error. Can you take a look? How can I fix it? thx. I tried Version 1.3.4 (release) and websphere-deployer-v1.4.7.hpi (beta), but got the same error. ..
Is the application already install on WAS Liberty? Is it trying to stop the application before it's even deployed. Please advise. [1/18/18 1:09:33:724 MST] 00001ce8 SystemOut O PLGC0048I: The propagation of the plug-in configuration file is complete for the Web server. dst24lp07Cell01.AppSrv01.webserver1. Is any clue why takes so much time ? Try increasing the deployment timeout in the plugin configuration. Thank you Greg to answer my question, I have changed the deployment timeout from 5 to 10. I'll try to run again the job and hope that this working. If you deploy manually, how long does it typically take? Hi Greg and all that supported this forum. For your reference we have discovered that the timeout parameter works at inverse, when we increased to 10 minutes the deploy took 30 minutes, when we increased to 20 minutes the deploy took 1 hour, after this discovering, we decided reduce the timeout parameter to 1 minute and the job took around 4 minutes, we decided try with 0 and run the job again, the job took 50 seconds. The default timeout parameter in 5 minutes affected our job. Thank you Greg for give us a clue about the issue. Please follow the instructions above on setting up the plugin. This error happens when you don't copy the WebSphere jars to the correct location in Jenkins. The WebSphere jars are required for the WDP plugin to know how to access WebSphere specific libraries. Hope this helps. I am getting the successful message in Jenkins as below as if the app/package has been successfully deployed. The WebSphere Admin console also shows that the app has been deployed. But I do NOT see the actual binary in the WebSphere "profiles\<node>\installedApps" folder (for a manual installation, the folder and binaries are created). When I try to load the app/page, I am getting the "file not found" error. The package makes all the way to the wstemp folder (\wstemp\109445637\workspace\cells\TS01TWS01Node01Cell\applications) but does not go to the final location. I am not sure what I am doing wrong! The jar files are properly copied, test connection is fine but never deploys properly. Tried on two different WebSphere instance, same issue. Please help! If you mean the "Generated context"/"context root", yes I did. I will submit a bug for it. Hi, I have this error. How can I fix it? You don't have credentials for authenticating to websphere? Do you have global security turned off? Yes, I have disabled global security. Greg, do you know where I can look for a problem? I have tried it on a new application server (9.0.0.3). As before Jenkins says that the deployment was successful but when it tries to start the app, WebSphere throws error saying that "extract binaries to temporary location:". I am not sure what I am doing wrong or what else can I try. Please advise. [7/17/18 14:12:50:327 PDT] 000000fe SystemOut O 2018-07-17 14:12:50.327 INFO 1640 --- [ Thread-99] c.i.w.m.a.InstallSchedulerImpl : ADMA5013I: Application iatse_war_new installed successfully. [7/17/18 14:12:54:155 PDT] 000000f9 SystemOut O 2018-07-17 14:12:54.155 WARN 1640 --- [rThreadPool : 6] com.ibm.ws.management.AdminHelper : ADMN1009I: An attempt is made to start the iatse_war_new application. [7/17/18 14:12:54:171 PDT] 000000f9 SystemOut O 2018-07-17 14:12:54.171 WARN 1640 --- [rThreadPool : 6] c.i.w.r.c.CompositionUnitMgrImpl : WSVR0190I: Starting composition unit WebSphere:cuname=iatse_war_new in BLA WebSphere:blaname=iatse_war_new. Binaries files were not added! [7/17/18 14:12:54:202 PDT] 000000f9 SystemOut O 2018-07-17 14:12:54.202 WARN 1640 --- [rThreadPool : 6] com.ibm.ws.webcontainer.annotation : SRVE8000W: Skipped class that failed to initialize for annotation scanning. [7/17/18 14:12:54:233 PDT] 000000f9 SystemOut O 2018-07-17 14:12:54.233 INFO 1640 --- [rThreadPool : 6] com.ibm.ws.webcontainer.webapp : SRVE0169I: Loading Web Module: iatse.war. [7/17/18 14:12:54:265 PDT] 000000f9 SystemOut O 2018-07-17 14:12:54.265 INFO 1640 --- [rThreadPool : 6] com.ibm.ws.webcontainer : SRVE0250I: Web Module null has been bound to default_host[*:9080,*:80,*:9443,*:5060,*:5061,*:443,www.teamservicesonline.net:80,www.teamservicesonline.net:443,beta.teamservicesonline.net:80,beta.teamservicesonline.net:443]. [7/17/18 14:12:54:280 PDT] 000000f9 SystemOut O 2018-07-17 14:12:54.280 WARN 1640 --- [rThreadPool : 6] c.i.w.r.c.CompositionUnitMgrImpl : WSVR0191I: Composition unit WebSphere:cuname=iatse_war_new in BLA WebSphere:blaname=iatse_war_new started. [7/17/18 14:13:56:980 PDT] 000000e8 SystemOut O Hibernate: select client0_.iat_client_id as iat_clie1_3_, client0_.created_by as created_2_3_, client0_.created_date as created_3_3_, client0_.delete_fl as delete_f4_3_, client0_.updated_by as updated_5_3_, client0_.updated_date as updated_6_3_, client0_.client_id as client_i7_3_, client0_.client_name as client_n8_3_ from IATSE.DBO.iat_client client0_ where lower(client0_.client_name) like ? Thanks for this plugin. I need your help with following issue. I am new to Jenkins and struggling for almost a week now with this issue. I have followed steps you have mentioned in the documentation about jars and certs. Test connection is successful. Error deploying to IBM WebSphere Application Server: org.jenkinsci.plugins.websphere.services.deployment. Any guidance will be helpful, thanks. 3) If you are logging into WebSphere with credentials that don't have permissions to deploy, you'll need update WebSphere's Users/Groups section to add another user with higher privileges than the one you're using. Edit: after new findings to avoid confusion for other readers. Thanks Greg for quick response. 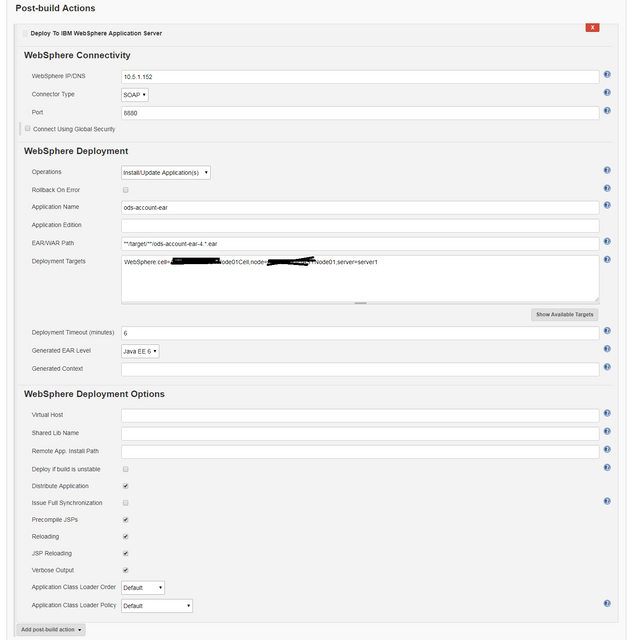 More information: Running the job on jenkins Master and have 777 permissions on EAR which is in jenkins workspace. I was able to resolve my issue and and the war is being deployed correctly now. But what I am seeing now during deployment, even though the folder structure is removed and being recreated with latest timestamp but the compiled java classes are couple of days old. At first, the classes are with latest timestamp and then another process (??) removes them and replace them with a older version of the class. Do you know what is causing it or know how to fix it ? This is a standard deployment of WebSphere. Hi... I am getting error with Websphere Liberty Profile.... How can i fix it? I am trying to deploy the artifacts from Jenkins Server (J) to the applications running on Server A and Server B. I followed the steps that are mentioned in the WebSphere Deployer Plugin and IBM WebSphere Liberty Configuration sites. I am successfully able to deploy the application to was liberty on Server A from Jenkins server (J). But with to tried to test the connection to Server B after i configured, i am getting the below error. I went through the all the comments for similar PKIX path errors, but you mentioned to enable Trust SSL Certificates for websphere and i dont see that option for liberty profile.... Please advise. "ADMA0089E: The AppManagement MBean is not found": i resolved it by correct WebSphere Connectivity Port setting which should be SOAP_CONNECTOR_ADDRESS port of Deployment Manager (default: 8879), not SOAP_CONNECTOR_ADDRESS port of Websphere Application Server. I gave shared lib name and it did not mapped after deployment of war. Could you duggest.